Home > Children & Teenagers > Does Your Child Have ADHD? ADHD – the full name for which is Attention Deficit Hyperactivity Disorder, sometimes just called ADD – Attention Deficit Disorder – is a behavioural problem that affects up to nine in every one hundred children in the UK. Some children with ADHD grow out of it, and the incidence in adults is lower – between two and four in every hundred adults are diagnosed with ADHD. Signs and symptoms of ADHD usually start when your child is around four years old and it is still a matter of debate whether ADHD in adults can develop even when they haven’t shown signs of the condition in childhood. Diagnosing this medical condition can be difficult – it is based on careful observation but there are no physical tests for ADHD. The main ADHD symptoms are listed below. If your child does have ADHD, he or she will probably show most of these behaviours in an extreme way, for most of the time. All children ‘act up’, misbehave and generally try their parent’s and teacher’s patience but children with ADHD have great difficulty remaining focused on anything and find it hard to interact with others. If you can answer yes to the majority of these questions, there is a good chance that your child does have ADHD and you should consult your GP to get an assessment by a specialist. Does your child have great difficulty concentrating on something, even for a few minutes? Does your child repeatedly make careless mistakes in schoolwork or homework? Does your child find it difficult to sit and play quietly, or look at a book while sitting still? Do you feel that you never manage to get through to your child when you speak to them? Does your child find it impossible to follow even basic, simple instructions? Does he or she find it difficult to organise anything – packing toys away, getting a school bag ready? Does he or she hate doing things that need concentration – do you get an extreme reaction to homework? Does your child constantly lose things, even personal things that they care about? 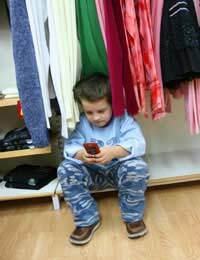 Is your child very easily distracted? Does your child constantly forget things that you have just asked him or her to do? Is your child very restless and unable to keep still? Does he or she fidget a lot, run around, jump around on furniture, and literally squirm in their seat when they have to sit down to eat a meal? Does your child’s school report that they often leave their seat when asked to remain in their place? Does your child talk all the time, unable to wait for other people to speak? Does he or she blurt out in class when at school and disrupt other children? Does your child find it difficult to wait for something – their turn at a game, etc? Does he or she seem to have no sense of danger? Do they do things without thinking at all about the consequences? Did you first notice these symptoms when your child was between the ages of four and seven? Making a definite diagnosis of ADHD is very difficult. All of the symptoms of ADHD are shown sometimes by children who are completely healthy. The full range and excessive nature of the symptoms can also occur in children with other disorders such as obsessive compulsive disorder, Asperger’s syndrome and general learning disabilities. Unfortunately, there is no blood test or DNA test that can say whether a child has ADHD. A specialist will make a diagnosis based on objective observations and by using a set of criteria that have been developed by other specialists. The World Health Organisation has developed on set of criteria – the ICD10. These criteria are basically a set of questions, more detailed and specific even that the ones mentioned above. If a child shows extreme behaviours typical of ADHD, they will score highly in the tests. Other conditions will be ruled out and the history of the child, including their performance at school will all be taken into account.